Jen has been struggling with making gloves for the past few years. Every pattern she tries ends in frustration, broken needles and last-minute trips to the fabric store for dye. 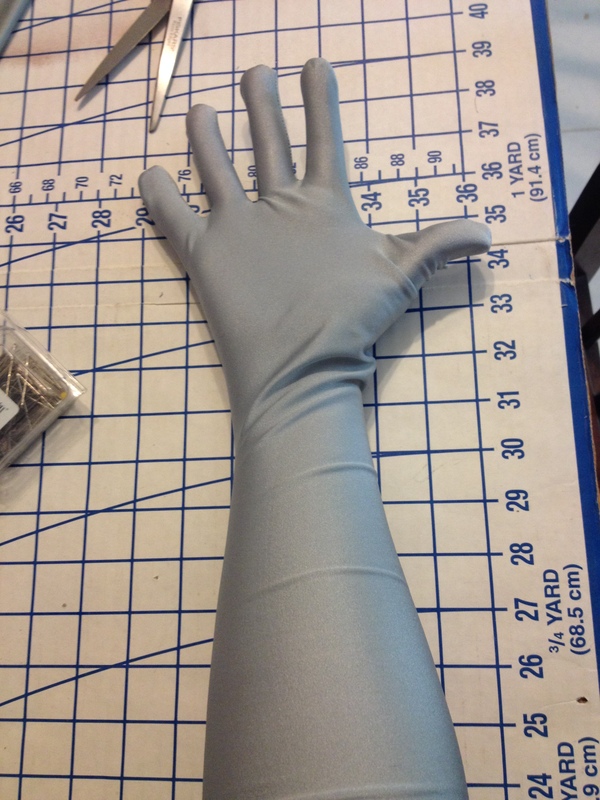 This year, since we started early with all our costumes, we decided to try making gloves once again. Jen found this tutorial online, and was able to make some modifications to it to find a final form. 1. Fold fabric and place fold line along the fabric fold. 2. Pin the pattern to the fabric and cut out. For the lines between the fingers, cut to the edge of the line. 3. Using a straight stitch, stitch as close to the edge as you are comfortable. Jen recommends using the edge of the presser foot as your reference point. When stitching at the bottom of the cuts for between the fingers, Jen recommends stitching straight under the cut (pictured right). Take your time! Going around the curves of the fingertips can be tricky! 4. Turn gloves right-side out and wear! You can finish the top edges by folding under the top and using a zig-zag stitch. Because this uses stretchy material, this pattern should fit a variety of hand sizes. We’ll be using this on all our costumes this year! Make a pair and let us know how they turn out! THANK YOU SO MUCH….U R A LIFESAVER! OR A COS-[LAY SAVER!!!! Happy to help! Let us know how it works out for you! Should I print the pattern as is or select “fit to page”? You should print the pattern as is. It should span 2 pages.